Ask us a Question about Travertine! What travertine surface finish is suitable for my area? Outdoor tiles or paving we recommend a tumbled and unfilled tile or paver. This ensures a maximum non slip surface. What are the MOST popular travertine colours? Outdoor tiles or paving we recommend a tumbled and unfilled IVORY travertine. Rustica is also very popular in Melbourne due to its very natural pitted surface ( which if preferred can be colour match grout filled). This ensures a maximum non slip surface. 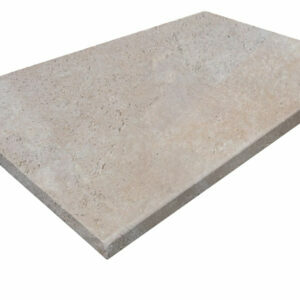 Indoor floor or wall tiles the 2 most popular colours are Ivory or Silver travertine. As a rule the Silver Oyster is often the preferred option due to the fact that it often has a light creamy beige background with silver swirl highlights. The surface finish often preferred internally is honed and filled. BUT if you are looking for a more rustic or rural farmhouse effect I would suggest using the unfilled tumbled and grouting with our colour matched travertine grout. Durability and Maintenance of Travertine Flooring. Travertine is a very durablematerial in flooring to heavy traffic. 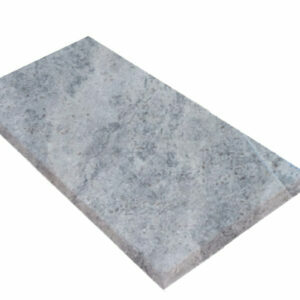 Also, it is a very hard material when compared with marble. ... Because travertine is porous, it can be susceptible to spills and stains. DURABILITY. Travertine Tile flooring is exceptionally durable. FLOOR TILES. Travertine floor OR wall tiles when installed on a white based adhesive bed are EXTREMELY durable in both a domestic OR commercial installation. Minimum ongoing maintenance is required. OUTDOOR TILES. Wether installed on a driveway or around a swimming pool travertine tiles or paving will not only delight you it will last the test of time. Due to the hardness (density) and low porosity you will be amazed at how it constantly looks beautiful wether 1 day old or 10yrs. What areas are suited to the installation of travertine? Family Room, Kitchen, Bathroom, Bedrooms and beyond. Pool Coping, Driveways, Steps, Capping, General Paving, Step Treads, Stepping Stones. Travertine is one of mother natures most enduring and timeless floor covering solutions. Travertine has stood the test of time from use as a floor tile in Roman villas to the building of the coliseum. Travertine as you can see from our above specifications usage as a floor or wall tile to an outside tile paving around your swimming pool. What are French Pattern Travertine Tiles? STANDARD FRENCH PATTERN TRAVERTINE. This travertine pattern is probably the most popular travertine tile design installed here in Australia. Sometimes referred to as Versailles Pattern it combines the following sizes to form a unique tiling pattern; 610x406, 410x203, 203x203, 406x406 all in mm. This pattern is extremely well suited to both smaller areas and large areas of paving. JUMBO FRENCH PATTERN TRAVERTINE. As the reference to jumbo implies, it is the extra large version of travertine french pattern. Well suited to large internal floors or large outdoor paving areas. We prefer this travertine pattern in rooms of at least 80m2 or outside paving areas in excess of 100m2 total area. What are the prices of tiles and pavers? Is Turkish Travertine the best? VALUE FOR MONEY. Turkish Travertine we believe represents TRUE value for money. As we deal DIRECTLY with the quarry owners and over time built a strong relationship we are offered 1st choice on the quarry blocks available for cutting into tiles or pavers. So not only can we GUARANTEE the best prices the quality at these low price levels is exceptional and others in the industry cannot offer the same. COLOUR SELECTION. Unlike Iranian or Italian travertine, the colour selection available in Turkish travertine is simply unequalled from anywhere in the world. Silver, Ivory, Brown, White pure colours to the multicoloured blends that we have achieved allow Turkish travertine to blend in to most if not ALL modern decor trends. What are the standard travertine sizes stocked? Travertine here in Australia is believe it or not based on U.S sizes. Whilst French pattern or Versailles pattern is the most popular size here in Australia, if you require a rectangular shaped tile or paver it will be 610mm x 406mm x 12mm or 30mm thick. Commonly stocked by the bigger retailers in a square shape is 610mm x 610mm x 12mm or 30mm thick. But when dealing with us we can virtually supply any custom size required. Pool coping tiles are usually stocked in a tumbled or bullnose edge in 610mm(L) x 406mm(W) x 30mm(T) or 610mm x 610mm x 30mm. Drop face pool coping is usually stocked in 610mm(L) x 406mm(W) x 40mm(D)x20mm(thickness at back of tile) OR with a 75mm Drop. Should I seal my Travertine once installed? It has long been our view that it is not necessary to seal travertine around swimming pools. However travertine should always be sealed in the following instances - in or around BBQ areas, driveways, ALL internal wall or floor applications, Outside entertainment areas where you will eat food. Stone Shield - being nearly invisible.